Month two of the Indian LAN Gaming Cup has only seen LAN gaming gain momentum with an interesting set of numbers to break down for you. Looking back at the month of May, here are some insights into the changing meta. 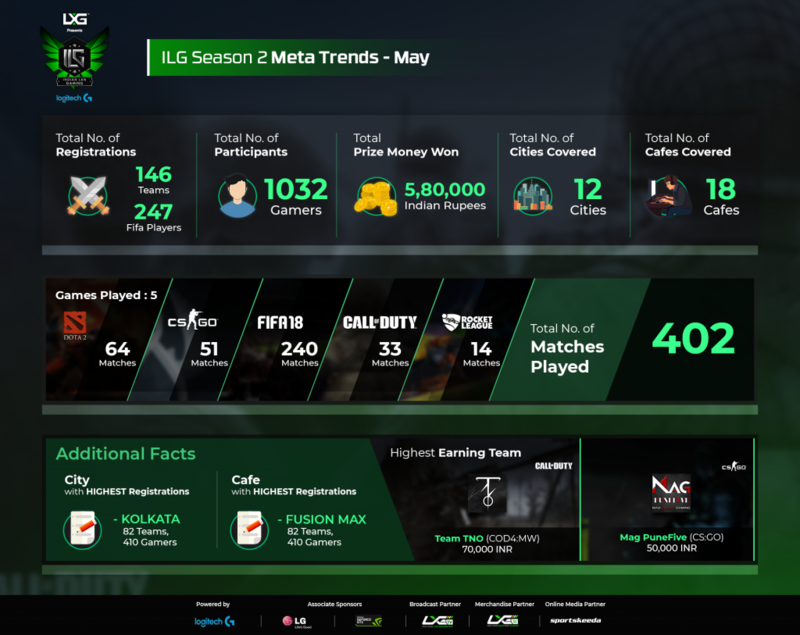 The month of May has seen the introduction of two new games being played, Call Of Duty and Rocket League. Hosted across 18 cafes in 12 cities this month, we’ve seen a huge spike in the number of matches played, with 402 matches played over all. Fifa 18 has been absolutely dominant as the most popular game this month with 240 sign ups, DotA 2 comes second with 64 matches played, CS:GO with 51, Call of Duty with 33 and Rocket league with 14. In an interesting change this month, we’ve seen a sign up of 1032 gamers in 146 teams, with 247 of these gamers being FIFA players. Fusion Max in Kolkata was the cafe that caused the city to have the highest number of registrations with all 410 gamers and 82 teams from the city gathering at the cafe. A prize pool of 5,80,000 INR was distributed amongst the winning players and teams this month, with the largest share going to team TNO for COD4:MW, at 70,000 INR. Mag PuneFive taking another huge chunk back home in the CS:GO brackets with 60,000 INR. Month two has really shown us the diversity in Indian LAN gaming with the warm reception we’ve had to the new games added in. The community has also shown us that console gaming is still incredibly popular with the explosive response to FIFA18 over the country, and that LAN culture is still thriving. With momentum building up, we hope to see more gamers this month of June especially with our new 1v1 tournaments, happening in every cafe, and for more information on these click here. Bring your team and sign up by clicking here.